Only 50,000 Chinese tourists out of the 10 million that traveled in Europe came to Greece last year, according to the Greek statistics service and data of the Athens International Airport (AIA). “This is a very small number compared to the popularity of our country in China,” Giorgos Drakopoulos, advisor of the secretary-general of the Greek National Tourism Organzsation (GNTO), said to the Athens-Macedonian News Agency. 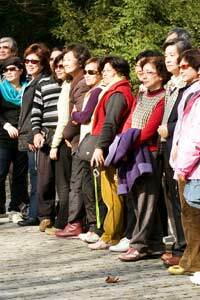 Drakopoulos estimated that after three years Chinese tourists visiting Greece could exceed 250,000. As he stated, the main reason for the small number of Chinese tourists in our country is the lack of direct flights from China to Greece. In order for an airline company to launch a direct flight, there must be high demand, he added and called out for coordinated actions. “A comprehensive marketing plan of at least three years is needed,” he stressed. Drakopoulos explained the importance of Greece opening to new markets as it cannot always depend on the traditional markets. Moreover, outgoing tourism in China is rapidly developing and according to estimates a total of 23 million Chinese are expected to Europe in 2025. Another quality characteristic of the Chinese tourists, he said, is that they tend to spend a lot of money on their holidays. Drakopoulos stressed the importance of Greek companies being prepared in order to welcome these tourists. A basic education of the characteristics and the needs of Chinese tourists is needed as well as a certification from the competent Chinese tourism authority that hotels and other types of accommodations are China friendly, he said. “We also need to create basic marketing infrastructure such as websites in Chinese, information material — brochures, shopping guides, and menus,” he added.